Let’s do savory today! Sweets are nice, but when you are trying to fit into a kind of form fitting wedding dress (one month to go!! ), you have to go with the savory side of things. I tend to shy away from vegan ricotta since it never seems to quite get close enough to the real cheese flavor.to give her version a try. Roasted garlic is one of those things that I always kind of forget about making, since it tends to be a bit time consuming, but the addition of the buttery roasted garlic to homemade vegan ricotta is too good to pass up. Really, roasting the garlic just takes 40 minutes a a little patience (because if you handle that stuff before it cools you are looking at some burned fingertips) and after that, it’s just time to blend away until your vegan ricotta is done! The red pepper bruschetta came from the need to use up a gorgeous heirloom tomato I snagged at the farmer’s market last week. I know the season is almost up for those precious beauties and I so wanted to give myself another shot at trying to actually savor the taste of a good tomato. I’ve always been a tomato hater, but when I discovered that ‘hey these are good when they are fresh!’, I’ve been trying to find ways to use them that doesn’t involve masking the tomato texture (i.e. salsa and pasta sauce). The bruschetta recipe is pretty loose, so season according to your taste. I do recommend tasting the ricotta mixture and adding in garlic accordingly. I made the mistake of dumping a bunch of garlic in, then tasting and the result was very bad breath for me and a blender that stunk of garlic for a good couple of days. I also used a bit of the leftover bruschetta as a mix in with pasta, so the leftovers are pretty dang versatile, if you ask me. p.s. Are you digging savory recipes? Tell me! I can’t eat peanut butter cups and cake for dinner every night, no matter how much I might want to. 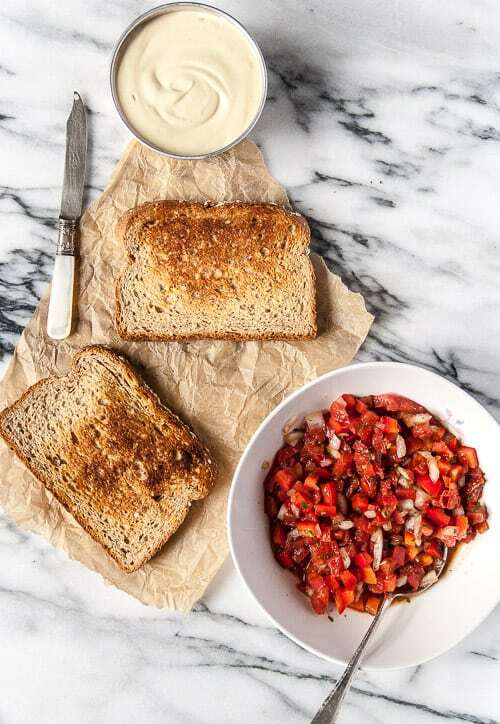 To make the bruschetta: Combine all ingredients in a small bowl, toss together and chill until needed. To roast the garlic: Cut off the top of the head of garlic, top with olive oil, wrap in foil and roast at 400 degrees F for 40 min. To make the garlic ‘ricotta’: Combine all of the ingredients in a blender, using only half of the head of roasted garlic to start. Blend on high, until mixture starts to become smooth and creamy, 1-2 mins.. If needed, add additional water to keep mixture blending. Taste and add more roasted garlic according to taste. Transfer to a sealed container and refrigerate for an hour before serving. Looks really great! Especially with summer tomatoes. Roasted garlic is a game changer. WEll done! Summer tomatoes are the best! Thanks Zainab! You bring the wine, I’ll bring the bruschetta! This ricotta recipe looks so interesting!! The combination of ingredients really intrigues me. Also, YOU’RE GETTING MARRIED?!?! I must have missed the announcement because OMG GIRL!! <3 <3 So excited for you and I can't wait for photos! Ahh!! Sending so much love! So this looks amazing! 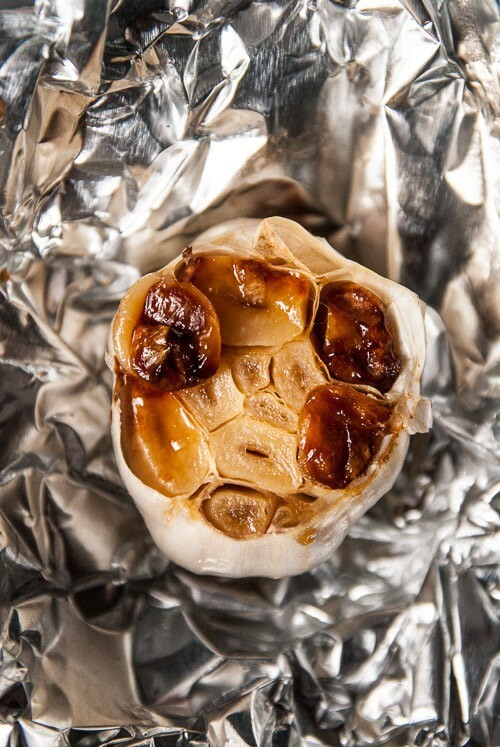 That roasted, caramelised garlic photo… stahhppp! Right?! Roasted garlic is my FAV! Savory is good in my book Abby! I always have compassion (misplaced?) for all of you dessert bloggers. If I made as many desserts as you all do, I would not be able to stop myself from eating them all! So, any recipe types you’ve got, I’m happy 🙂 I hope your wedding planning doesn’t get too overwhelming. 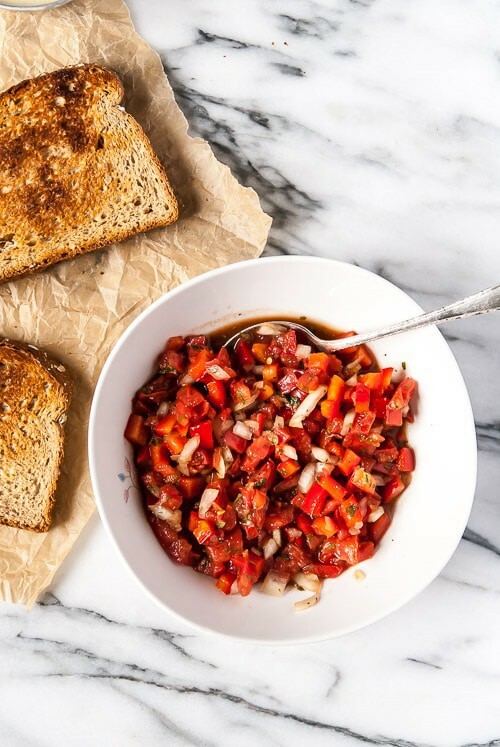 Garlicky vegan bruschetta is a DREAM! I’m always here for the savory recipes 🙂 Pinning! YAY! Sometimes you have to eat something other than cake, right? I’ve been wanting to make vegan cheese foreeeeeeevaaaaaaaaaah! Gaaaah, I have no excuse. I must get me some cashews and get to cheesing…so that I can make this insane-o tasty bruschetta! Get to cheeeesing girlfriend! I’ll throw a wine and cheese party and you can just come,ok? Ha, I feel you lady! Bring on November when I don’t have the prospect of fitting into a corset hanging over my head…Loving the sound of this bruschetta and that roasted garlic vegan cheese sounds totally and utterly divine! I can’t wait for that day, it will be so so nice! Ohh, this bruschetta sounds SO good. I have to say, I’ve never tried vegan cheese of any kind, but I could totally go for this. 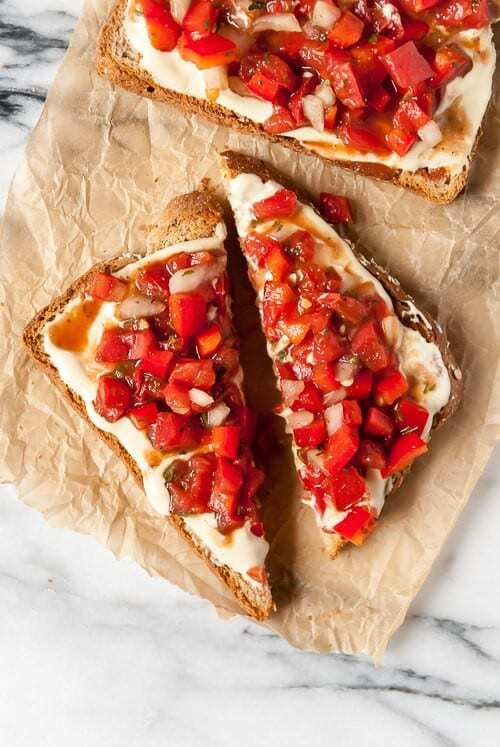 Those bruschetta topped toasts are too pretty! Thank you for the sweet words Alena! Thank you Shanna, it’s pretty darn good! 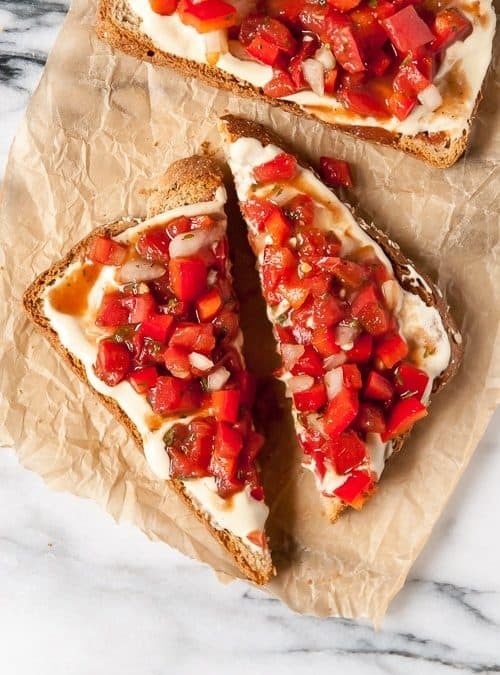 Such a delicious bruschetta!! I love those red peppers on there! This. This is exactly what I’ve been craving. What a great appetizer recipe, love it!